Bouncy castle, ballet dancing, Zumba, karate demonstrations and arts and crafts activities for the children… Take part in all of this and much more at the Family Fun Day at YMCA Hawker, Saturday 19 September between 10am and 2pm. The Family Fun Day is all about giving people a taste of what this family-friendly centre situated alongside the river Thames in North Kingston has to offer. Will you take the gym challenge? There will be plenty of taster sessions showcasing some of the many exercise classes offered at the centre, including Zumba. And if you take on the YMCA LSW fitness instructors in a series of gym challenges, there are chances to win great prizes. For the cyclists, there will be opportunities to have your bike checked and marked by the Met Police. Children up to eight years can bounce, wiggle and jump in The Pod soft play, which will be offering free 30 minutes sessions between 8am and 12 noon. No need to pre-book, just turn up. And on the outside fields, there will be more opportunities to jump around in the big bouncy castle, and to get active with the different children’s sports activities which will be taking place throughout the day. Kids will also have the opportunity to design their own t-shirts and bags, be face painted and to take part in a dance session with Luna Boo, YMCA St Paul’s Group’s green mascot. At last year’s Family Fun Day we chatted with Fabio, a Berrylands resident who was there with his daughter. “We went to The Pod first, but we also used the bouncy castle, rode on the scooters, coloured some insects and did the face painting. It’s great to see more of what the centre has to offer,” said a happy Fabio before rushing off to partake in more activities with his daughter. “We’re really excited about this year’s Family Fun Day”, says Anthony Wright, Centre Manager at YMCA Hawker. “In addition to all the children’s activities and fitness tasters and demonstrations, we will have a live band, a lucky dip with great prizes and of course there’s lots of delicious food to be purchased from the café. 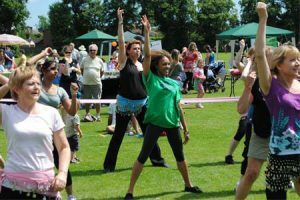 Now all we need is a good weather forecast, but come rain or shine – the Family Fun Day will still be a great day out for families in Kingston and the surrounding areas”.